It's Cowboy vs. Cowboy in Pittsburgh. 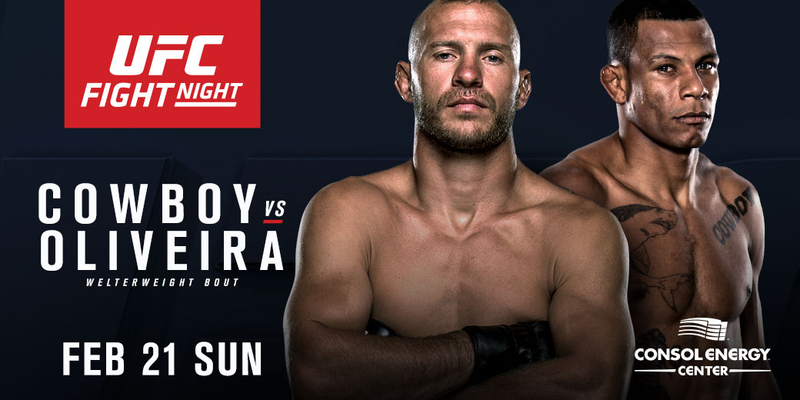 The UFC has confirmed that Alex Oliveira faces Donald Cerrone in the main event of the February 21st event. Oliveira, who replaces Tim Means on the card, explains how a late night call helped make the fight a reality. "I had just finished training at 11 p.m. My brother's truck had a flat tire, so I went over to help him. When it was 1 a.m., my phone rang and my coach asked if I wanted to fight Cerrone. I said: 'Why not? '", said Oliveira, revealing that he already had his eyes on a fight against the American Cowboy. "I watch his fights. I had told my coach before, we would face each other no later than this year. I knew it was going to happen, I just didn't know it would be this fast." This is the third time Oliveira fights as a late replacement in the UFC, and it's the first time he might fight for five rounds. But none of this intimidates the fighter from Três Rios, Rio de Janeiro, and he promises to have the best fight of the card. "It's gonna be a big fight, because we are both strikers. We're cowboys, an American and a Brazilian, and we both stand and bang. It's gonna be fight of the night, and it's on my birthday night. I'm going to give myself this gift. It's my first five-rounder, but I hope it won't go past the third. We will beat each other up."